Working safely with hazardous chemicals requires adherence to strict safety procedures and the use of specially-designed protective equipment. Before working with any chemicals, an assessment of the way in which the worker will interact with them will need to be made, for example, how hazardous are they? Will the worker be wading through chemicals, pouring them from a bottle into a test tube, or will particulates be in the air? Depending on the hazardous nature of the chemical, appropriate personal protective equipment (PPE) may need to be worn by individual members of staff, and all such PPE will need to comply with regulations and be used in line with the manufacturer’s instructions. Examples of PPE against chemicals include chemical suits, footwear, hand protection and eye protection. For some hazardous situations, suits must be used in conjunction with gloves, boots, head/face protection and breathing apparatus. Some suits, particularly gas tight or type 1, can be supplied with gloves and boots attached. Some variants allow the gloves and boots to be detachable but for other suits the gloves and boots are permanently attached. Chemical protection suits, also known as protective coveralls or overalls, provide an additional outer layer that fully encapsulates the wearer. They can be disposable, which means that they are thrown away after each use, or they can be reusable and require cleaning inside and out with a specialist product. 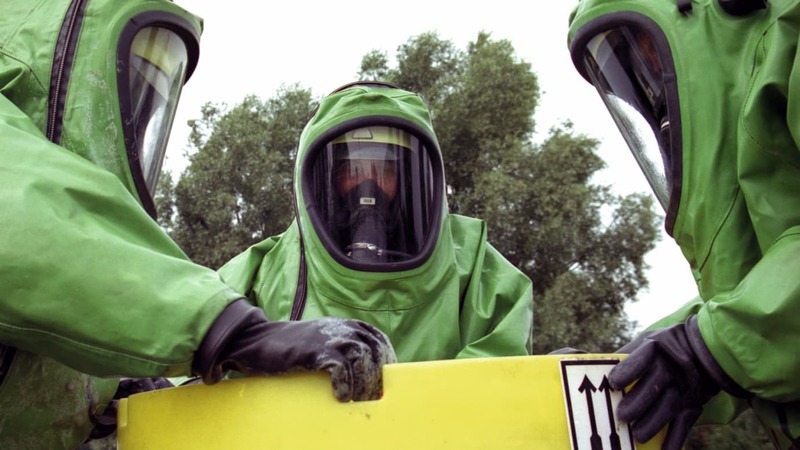 Disposable chemical suits are widely used because they are lightweight, pose little ergonomic burden and can be disposed of if contaminated. They are designed to withstand a light chemical mist or spray, or ingress of solid particulates. Disposable chemical suits are either type 5 or type 6. A type 5 suit meets EN ISO 13982-1 – protective clothing against solid particulates, whereas a type 6 suit meets EN 13034 – protective clothing against chemical mists/sprays. Often the same suit will protect against both hazards. To qualify as type 5, suits must pass a whole suit inward leakage test specified in EN ISO 13982-2. This assesses the ability of the suit and its closure systems to prevent particulates reaching the face, especially nose and mouth of a wearer. The test takes place in an enclosed atmosphere into which a non-toxic particulate simulant is released. It is essential to meet the requirements that the suit manufacturer or supplier provides clear instructions how to avoid the ingress of particulates in interface areas such as the areas of overlap between the suit and the facemask/gloves/boots. Type 6 suits must also pass a whole suit test, but this time the suit is tested against a mist or fine spray of water. The water is dosed with a surfactant (mild detergent) to produce a specified surface tension and a dye to aid assessment of leakage. The test subject wears an absorbent suit underneath the one to be tested, which absorbs any leaks and is stained by the dye. Success or failure is determined by measuring the total area of any stains on three suits and comparing this with the requirement. Leaks will typically occur at closures and interface areas, but the liquid can also seep through the material itself. A range of other tests is specified, including resistance to abrasion, resistance to flexing (type 5 only), tear strength, tensile strength (type 6 only), resistance to puncture, resistance to penetration by liquid chemicals (type 6 only) and seam strength. In the test for liquid chemical repellency and resistance to penetration by liquid chemicals, a bank of four test chemicals is given in the standard although the requirement is that the suit material demonstrates adequate repellency and resistance to penetration against just one chemical from this list. The four test chemicals used for liquid chemical repellency and resistance to penetration by liquid chemicals are: 30% solution of sulphuric acid, 10% solution of sodium hydroxide, s-xylene and butan-1-ol. In terms of splashes and spills from liquid chemicals, the worker’s lower limbs and feet are of particular concern and, therefore, specialist footwear has been developed to protect against exposure to chemicals. The level of protection against chemicals provided by a particular item of footwear will depend not only on the construction of the boot in terms of its upper height and freedom from holes, but also the choice of materials used to produce the footwear, as these need to be resistant to the chemicals against which protection is required. The materials protect the foot by preventing the chemicals reaching the inside of the footwear. To be effective, each material must not only resist the passage of the chemicals through its structure, called ‘permeation’, but also these materials must resist degradation by the chemicals that would lead to damage such as cracking or holing. Generally, it is relatively simple to assess the resistance of a footwear material to permeation or degradation by a specific chemical. However, the value of the information gained from testing with one chemical is limited. It might provide some indication of the possible behaviour with a similar chemical, but will tell nothing about the material’s resistance to permeation or degradation by a quite different type of chemical. For this reason, it is important to ensure that materials are chosen on the basis of known resistance to the particular chemicals against which the footwear is intended to protect, not simply on information about performance with other chemicals, which may be of no relevance. In 2006 the European standards technical committee CEN/TC161 developed EN 13832, Footwear protecting against chemicals, which gives details of the tests to be carried out on such footwear and the requirements to be met. EN 13832:2006 consists of three parts. Part 1 covers terminology and provides details of specialised test procedures such as permeation and degradation. Part 2 specifies requirements for ‘footwear resistant to chemicals’ and, by reference to the standards for safety and occupational footwear (namely EN ISO 20345-7), covers issues such as physical performance of the upper and outsole materials, and criteria for other protective features offered by the footwear – including protection to the toes against impact. Part 2 of the standard only includes the degradation testing procedure in relation to chemical testing. All-rubber and all-polymeric footwear is subjected to air leakproofness testing and other footwear is tested for dynamic flexing to test for resistance to water penetration, but products are not tested for chemical permeation. However, the standard is currently being revised and the latest draft revisions of Part 2 include an additional chemical splash test which is intended to assess chemical protection against an accidental spillage. Part 3 of EN 13832:2006 specifies requirements for ‘footwear highly resistant to chemicals’. It covers ‘all-rubber and all-polymeric footwear’ and specifically excludes leather footwear, low shoe and ankle boot designs. Part 3 covers the situations where a higher level of confidence in the protective properties of the footwear is required – for example, where protection is required in a relatively high-risk situation, such as may involve a particularly aggressive chemical. Unlike Part 2, Part 3 requires the chemical permeation resistance of the footwear materials to be tested, as well as their chemical degradation resistance, and provides performance levels based on the permeation test results. Part 2 allows greater flexibility to the footwear designer than Part 3, by permitting the use of ankle boot styles and by not restricting the choice of material types, other than by excluding leather outsoles. Both Parts 2 and 3 list the chemicals to be used in applying the standard and specify the marking to be applied to the footwear and the information to be supplied by the manufacturer. This includes details of the chemicals against which the footwear has been tested. Within Europe, glove testing is carried out in accordance with EN 374-3:2003 to determine whether gloves are resistant to permeation by chemicals. However, for EC type-examinations relating to CE marking, this will be replaced by EN 16523-1:2015 in the future when it has become an EU approved harmonised standard. To show that chemically protective gloves, suits and footwear sold within the European Union have been type-approved against the PPE Directive 89/686/EEC (or the forthcoming PPE Regulation (EU) 2016/425), they must bear the CE certification mark. Chemical protection falls within the complex (category III) of the directive and therefore production samples need to be regularly assessed. 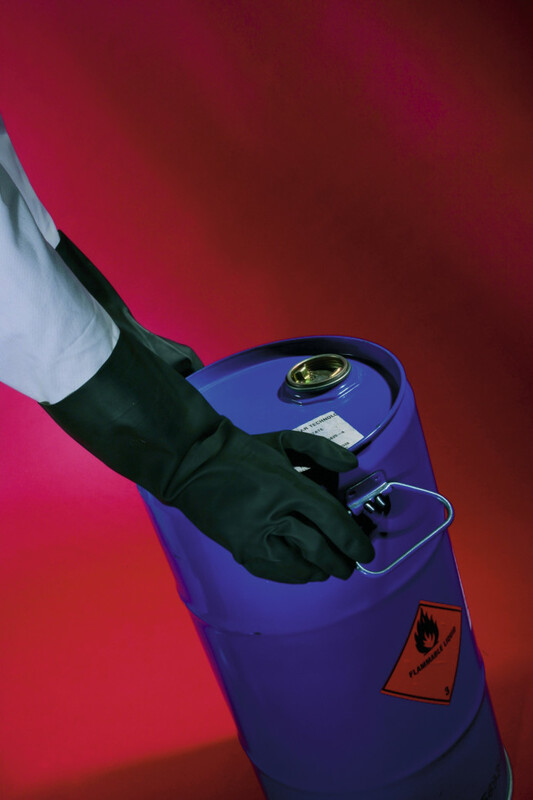 In order to display the CE mark for chemically protective gloves, the Notified Body assessing the product will require testing to have been carried out in accordance with the EN 374 series of standards. The results of this testing will determine the appropriate pictogram symbols that can be used on the packaging and labelling. However, these marking requirements will change when the revisions to EN 374-1:2003 are published. With protective gloves, both the material the glove is made from and its thickness are important factors as to whether the glove will give sufficient protection against a particular chemical. A disposable natural latex glove will, for instance, generally give barrier protection against only dilute aqueous chemicals, whereas a thicker polychloroprene (‘Neoprene’) or polyvinyl chloride (PVC) gauntlet would be expected to give acceptable resistance against organic solvents such as methanol and acetone. Natural latex is a material that is generally susceptible to permeation by organic solvents. Permeation is the process by which a chemical moves through the material at the molecular level. Sometimes this occurs without any physical changes to the material, such as swelling, cracking or a reduction in its elasticity. To be certified as chemically protective and to bear the conical flask pictogram (Figure 1), in addition to satisfying the requirements for EN 374-2:2014 – ‘Resistance to penetration’, a glove must achieve at least performance level 2 for three or more chemicals from the 12 listed in the European standard EN 374-1 Annex A (Table 1). These 12 chemicals were selected to represent some of the most common types of chemicals in industrial use. 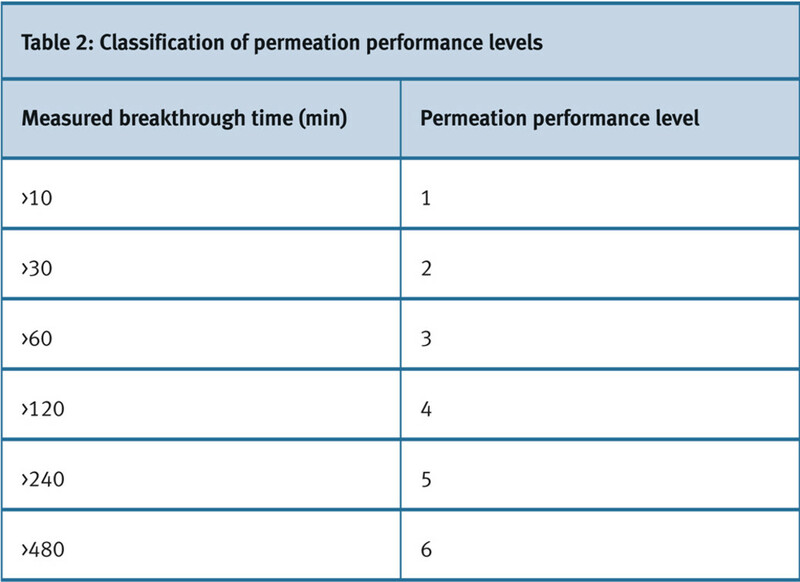 There are six different performance levels, depending on the ‘breakthrough time’ achieved by the glove. This is the time from the start of the test to the time the chemical is detected moving through the material at a defined rate. 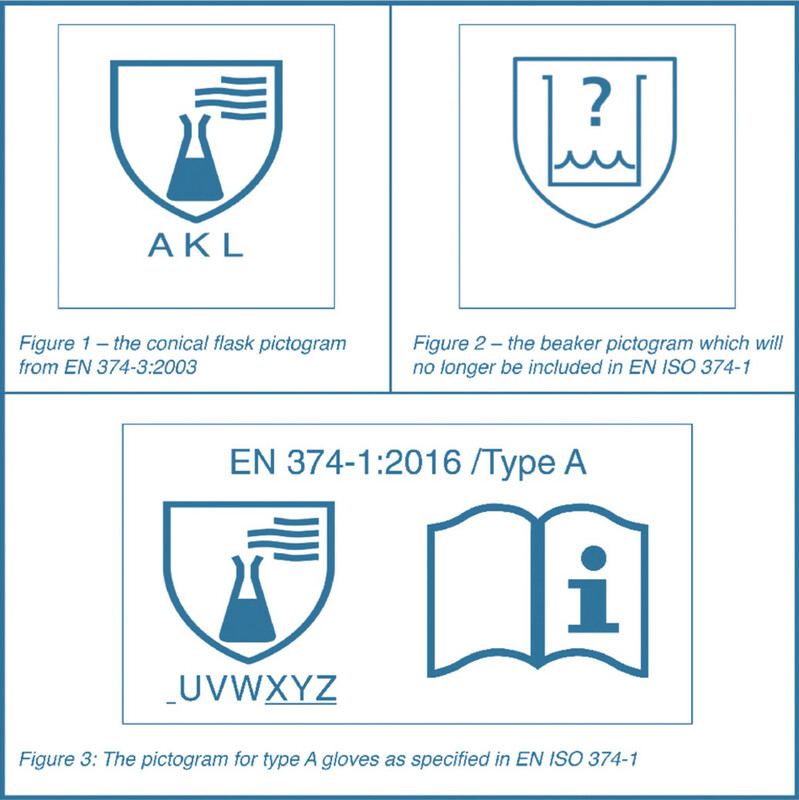 The conical flask pictogram is printed on the certified gloves, and the letters below this pictogram denote the relevant code letter of the chemicals that achieved at least a performance level 2 when tested in accordance with EN 374-3 (see table 2). The conical flask pictogram can only be displayed if the glove also satisfies the EN 374-2 penetration requirements. A beaker pictogram (Figure 2) is used to denote that the glove meets the penetration requirements and thus provides barrier protection. This beaker pictogram can also be used if the standard EN 374-3 is quoted on the packaging when alternative chemicals to those listed in EN 374-1 Annex A have been tested to EN 374-3, or the conical flask pictogram criteria explained above have not been satisfied. Full details of the chemicals tested and performance levels achieved must be included in the user instructions. Both pictograms shall not be used together on the same glove. It has been more than 13 years since the current version of EN 374-3 was published. For type-approval testing, it will be replaced by EN 16523-1. This has been developed specifically for the CE-marking of chemically protective gloves, clothing and footwear. The method is technically very similar to EN 374-3, with no significant changes to the testing procedure. Currently, EN 374-3 test reports are still being accepted by Notified Bodies, but this will change once EN 16523-1 has been harmonised. Where the glove industry will notice significant changes is with the updated protective chemical glove requirements standard, EN ISO 374-1. 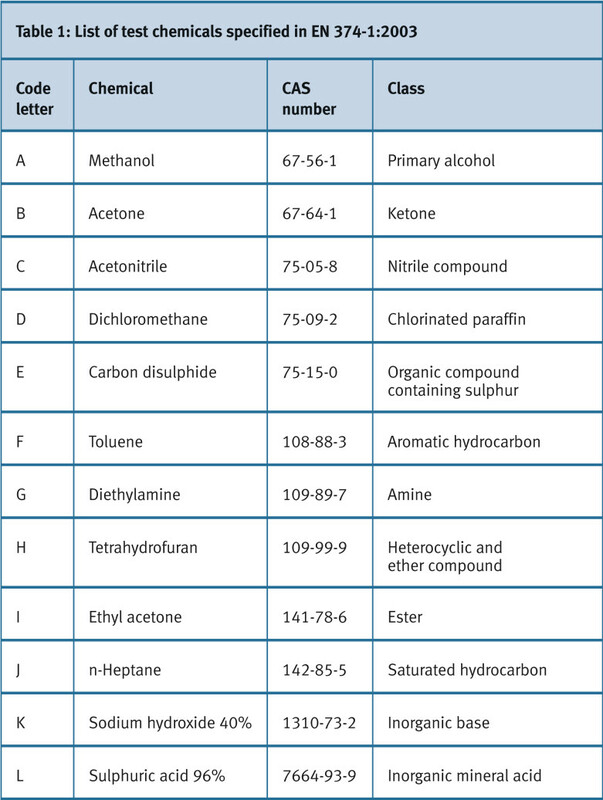 When the document is published, the list of challenge chemicals will increase from 12 to 18, with the addition of the six chemicals listed in Table 3. The labelling requirements will change significantly as a new classification approach has been adopted. Gloves will be classified as ‘Type C’ if performance level 1 is achieved against at least one of the 18 listed chemicals. ‘Type B’ classification is for gloves that meet level 2 against at least three of the 18 chemicals, and ‘Type A’ gloves will achieve a performance level 2 against a minimum of six of the 18 chemicals. Figure 3 shows an example, with the book symbol instructing the wearer to read the user instructions. The glove classifications must continue to satisfy the requirements of EN 374-2 and EN 420 (or its replacement – EN ISO 21420) as with the existing requirements. As a result of these three new classifications, the beaker pictogram will become obsolete. Currently, the beaker pictogram is also used to denote resistance to microorganisms if at least level 2 is achieved for the acceptable quality limits (AQLs) in EN 374-2 Annex A. However, resistance to microorganisms will be assessed in accordance with EN ISO 374-5 once this standard is published. 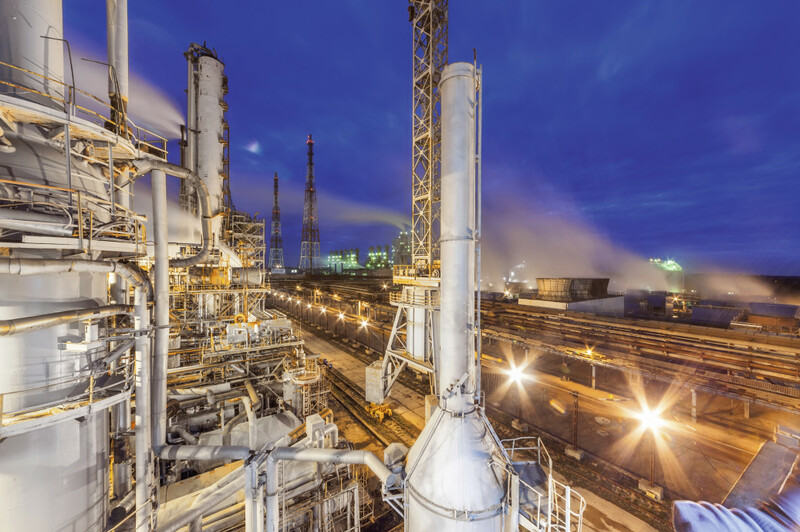 This article introduces some important changes to the European Safety test standards and the way that chemical protection is evaluated. Health and safety advisors and users of the equipment should ensure that products are CE marked and meet appropriate performance requirements for the work being carried out.